The Spanish government is considering calling a snap election on 14 April, according to the EFE news agency and other media in Spain. This speculation comes only one day after a demonstration in Madrid asking for a snap election and for Prime Minister Pedro Sánchez to step down. The rally was joined by Ciudadanos (Cs), the People’s Party (PP), and far-right Vox, among others. They also protested against the dialogue started by the Sánchez’ Socialist (PSOE) party with the Catalan government over the Catalonia crisis. Holding an election on 14 April would mean casting ballots only one and a half months before the local and European elections – as well as a regional one in many of the Spanish territories. 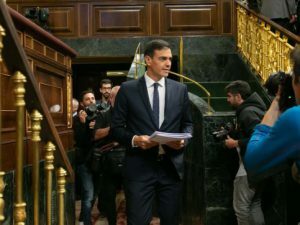 Although being in favour of dialogue with the pro-independence parties, Sánchez insisted on Monday that independence is ‘neither constitutional nor wanted by the majority of Catalans’.